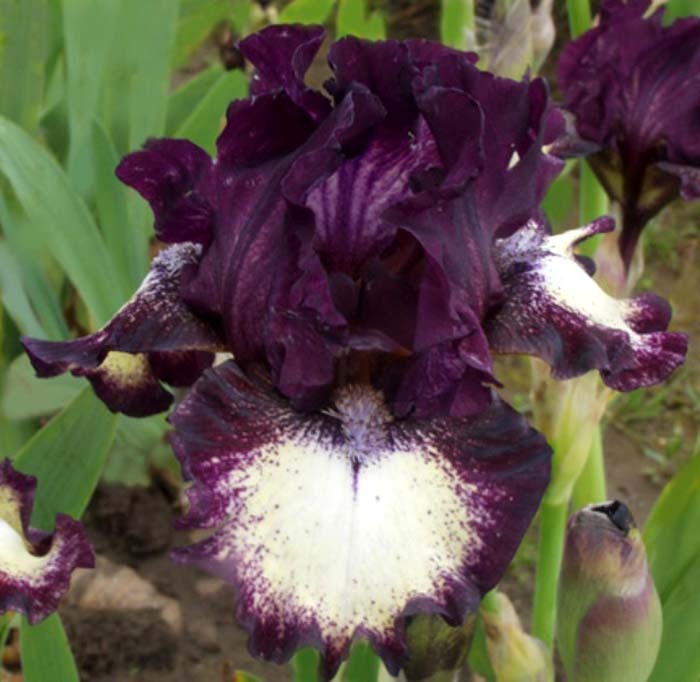 'Spectator' ( Keith Keppel, R 2011) Seedling #06-225B, IB, 22" (56 cm), Midseason bloom. Standards prune plum (M&P 47-J-8), faint cream sanding at center base; style arms prune plum, crests dark brown to reddish plum; falls center cream white to lemon cream (9-F-1), prune plum shoulders and 3/16" to 1/8" solid band; beards white to light yellow tipped brown, lavender white lightly tipped purple to tan at end. 'Ruby Eruption' X 'Class Ring'. Keppel 2011. Honorable Mention 2014, Award of Merit 2017. From Keith Keppel Iris catalog, 2011: SPECTATOR M 22" (Ruby Eruption X Class Ring) Strong color and sharp contrast make it well worth watching. Prune plum standards barely show cream sanding at base. Cream white to lemon cream falls carry prune plum shoulders and solid marginal band. Inconspicuous beards of white, light yellow, brown and purple. Good garden effect. #062256. $20.00; 3 for $50.00. jpg Spectator4.jpg manage 70 K 09 Oct 2018 - 03:16 Main.TLaurin Photo by Sunshine Iris Nursery-Australia.